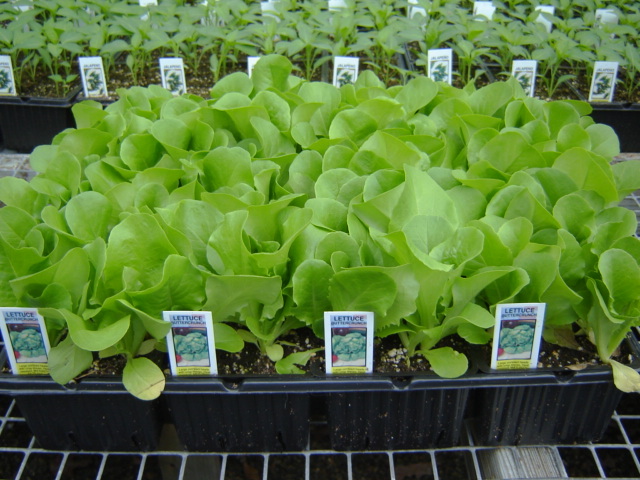 Kristen's Country Greenhouses - products We are always planting something, so when you come to our greenhouses, you will see crops in different stages of development, from just planted to a finished product. We are always planting something, so when you come to our greenhouses, you will see crops in different stages of development, from just planted to a finished product. 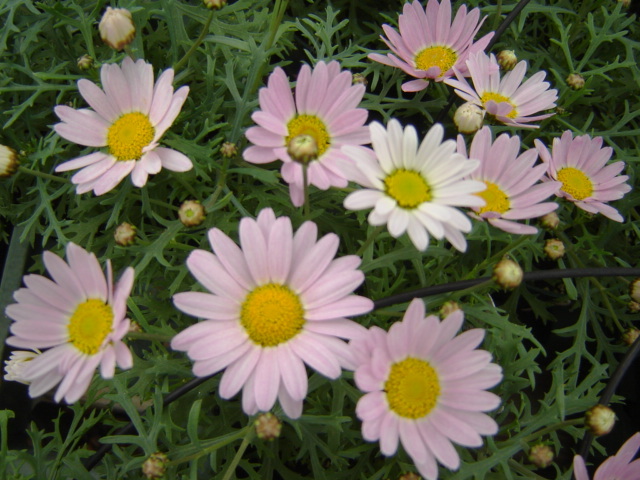 We carry a wide range of annual bedding plants from Ageratum to Zinnia. They are grown in 806 flats, or 8 packs of 6 plants each. Exceptions are as follows: African Marigolds and Zinnias are grown in 804 flats, or 8 packs of 4 plants each. Cucumber, Squash, and Nasturtium are grown in 803 flats, or 8 packs of 3 cells (several seeds to a cell). Tomatoes are available in 806 and 803 flats, and also as 4" pots. Beautiful hanging baskets are available in 10" and 12" pot sizes. Select from premium varieties such as angelonia, calibrachoa (million bells), fuchsia, super petunia, lobelia, torenia, verbena, and many more! Our lovely premium annuals include bacopa, calibrachoa, double impatiens, lantana, tuberous begonia, wave petunia, sweet potato vine, vinca vine, and many more! These versatile plants can be used in beds, containers, window boxes, and hanging baskets. We grow zonal geraniums propagated from vegetative cuttings. Everything is propagated on site. We use Bartlett varieties which are adapted specifically for New England conditions. We grow healthy, bushy plants with several flower umbels. They are available in a wide range of colors and in 4 1/2", 7", and 10" size pots. Select your favorite varieties of tomatoes and peppers, as well as lettuce, squashes, cucumber, eggplant and more! Grow your own fresh produce high in vitamins, and eat healthier while saving money at the grocery store! Try canning, freezing, or storing them in a cool, dark place to enjoy them into the fall and winter. You will find all your favorites such as basil, dill, rosemary, and thyme, just to name a few. Use them fresh in all your favorite dishes, or dry them yourself instead of buying dried, bottled herbs. Our perennials will fill in your beds with beautiful color, saving the time and expense of replanting every year. You will find spring bloomers such as bleeding hearts and astilbe, summer bloomers such as day lilies, hosta, coneflowers, rudbeckias , and grasses, and fall bloomers such as sedum. We have recently added ground covers to our product line. Myrtle, baltic ivy, and pachysandra (3 varieties) are available.